Plug Square credit-card reader gizmo into your Android smartphone or iOS device (iPhone, iPod Touch, and iPad) and presto, you can accept credit-card payments anytime, anywhere! Just swipe and go. The Square app is available for free download. This gizmo is by far the fastest and easiest way to set up a merchant account, and it has the advantage of being completely portable. It's a great deal for small businesses that can't afford traditional credit card machines or the monthly and yearly upkeep fees that many companies still charge. You pay only a small percentage of each transaction. No monthly or annual fees. The company charges 2.75 percent per swipe for Visa, Mastercard, Discover, and American Express. People love the fact that the reader plugs into the headphone jack on your iOS or Android device; it's not some bulky custom case the works only with select models. The card reader has a suggested retail price of $9.95 with a $10 rebate upon signup for new users. 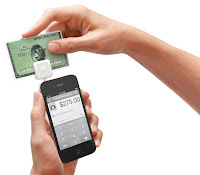 Business owners looking to turn their mobile devices into credit card machines can now purchase the Square Card Reader at many stores (Apple, Best Buy, OfficeMax, Radio Shack, Target, UPS, Wal-Mart, Walgreens, Staples, and FedEx stores) across the U.S. If your reader has yet to arrive, is lost, or if you're making a phone, mail, or online sale, you can still accept payments using the manual entry feature. It's an incredible solution for instructors, salespeople, service providers, booth operators, and anyone else needing fast, convenient, mobile payment-processing.